Apple on Friday reinstated a number of games recently stricken from the iOS App Store for bearing references to the Confederate battle flag, a polarizing symbol that some equate to slavery in America. Game-Labs, whose app Ultimate General: Gettysburg was pulled from the App Store on Thursday, announced it reached an understanding with Apple last night and would consequently restart sales of the American Civil War battle simulator. "Ultimate General is back. Unchanged," the developers said in a blog post update. "After several late night phone calls with Apple yesterday and today the game has returned to Appstore the way it was... in 1863." 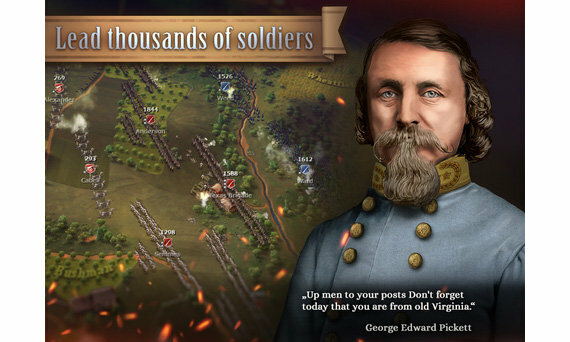 When Ultimate General: Gettysburg was first taken down as part of a larger culling, Game-Labs refused Apple's request to remove depictions of the Confederate flag, claiming such a change would be incongruent with the highly detailed and historically accurate Civil War engagement simulator. The flag pattern technically started life as the Battle Flag of Northern Virginia before being adopted as the Confederacy's second national flag, the Confederate Navy Jack and other military standards of the era. Following the South's defeat, the flag for many stood as a commemoration of fallen soldiers. In the 1940s, it was resurrected as a political call to arms against federal civil rights initiatives. For its part, Apple stated only games that use the Confederate flag in "offensive and mean-spirited" ways will be affected by the App Store policy modification. Apps depicting the flag for "educational or historical" value remain untouched. Apple's decision to wipe Confederate flag references from the App Store was influenced by a racially motivated shooting at a historically black church in Charleston, South Carolina. The incident left nine people dead. A public outcry called for the flag's removal from government buildings, which subsequently bled into the consumer space with Amazon, eBay and Walmart all halting sales of Confederate flag items.